Full Moon Bites: Interview with A. D. Koboah, author of Dark Genesis! Interview with A. D. Koboah, author of Dark Genesis! Holly: Hi A. D. Koboah! Would you tell us a little bit about yourself? A. D. Koboah: Hi, Holly. 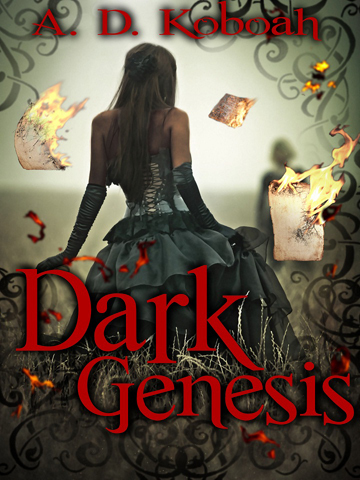 Thank you for featuring my debut novel Dark Genesis on your site. My parents are from Ghana, West Africa, but I grew up in London. I worked for a Facilities Management company until I became unemployed in 2005 and thought that would be a good time to focus on my first love, which is writing. Holly: Can you tell us a little bit about your book Dark Genesis? A. D. Koboah: It is an unconventional Paranormal Romance set in Mississppi in 1807. Its protagonist is a slave called Luna whose life changes dramatically when she attracts the attention of a tormented vampire. Although it is classed as a romance, it’s quite a dark, sad story which focuses on dehumanization and how it affects the psyche. A. D. Koboah: I enjoy the fantasy genre because there are no limits to the kind of world and characters you can create. Reading and writing is a brilliant form of escapism and so it is extremely liberating to be able to create a world and characters which have no limits. And so much more fun. A. D. Koboah: I would have to say that the characters came first. Since the main theme is dehumanization, I had to start with characters that have been dehumanized. That led me to slavery and the plot evolved from there. A. D. Koboah: Yes. I am publishing another novel called Peace. It is a completely different genre, a contemporary novel set in London about a young woman who is using heroin to bury painful past memories. I actually wrote Peace before Dark Genesis but kept making revisions as it just didn’t feel right. Holly: What is the hardest part of writing in your opinion? A. D. Koboah: Getting into the zone. Getting to that stage where the plot and characters are so clear in your mind that it is all you think about. Once I get to that stage I usually find it very hard to do anything but write and I usually lose a lot of sleep during that period. Holly: Where do you see yourself at in five years—writing wise? A. D. Koboah: I should have finished the Darkling Trilogy by then and hopefully be an established writer. I am officially a publisher now (I still can’t believe it at times) so at some point I will probably look at publishing other people’s work. But I want to make sure I know the business inside and out before I even consider something like that. I have recently finished a screenplay and have ideas for two more, so one of my goals is to get at least one of those screenplays made into a film. A. D. Koboah: I would say that they should always expect something slightly unusual from my novels as I tend to put an unconventional spin on whatever I decide to write about. Holly: Have you ever read a book that made you so mad, sad, happy, and excited and so many other emotions that even though you loved it your might not ever read it again? If so, what book? A. D. Koboah: A Thousand Splendid Suns by Khaled Hosseini. I really fell in love with Mariam, one of the main characters, and I got really caught up in her story and the sacrifices she made for the ones she loved. I can honestly say that I have never cried as much as I have when reading that book (I’m getting teary even thinking about it). It does have a happy ending but you go through one hell of a rollercoaster before you get there. A. D. Koboah: At night when it’s really quiet. A. D. Koboah: Supernatural. I’m a series or two behind – but OMG Castiel!!!! A. D. Koboah: Paperback. Ereaders are so convenient but nothing beats a proper book for me. A. D. Koboah: It changes all the time, but at the moment, it’s Lord of the rings. Dark Genesis is a love story set against the savage world of slavery in which a young woman who has been dehumanised by its horrors finds the courage to love, and in doing so, reclaims her humanity. A.D. Koboah was born in London and completed an English Literature degree in 2000. Her first novel, Dark Genesis, was inspired by the concept of dehumanisation and the impact it can have on the psyche. She is currently working on a screenplay and will begin the sequel to Dark Genesis shortly. 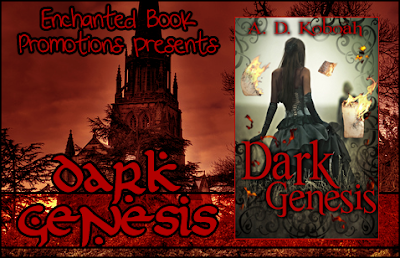 Thanks for featuring Dark Genesis on your website.